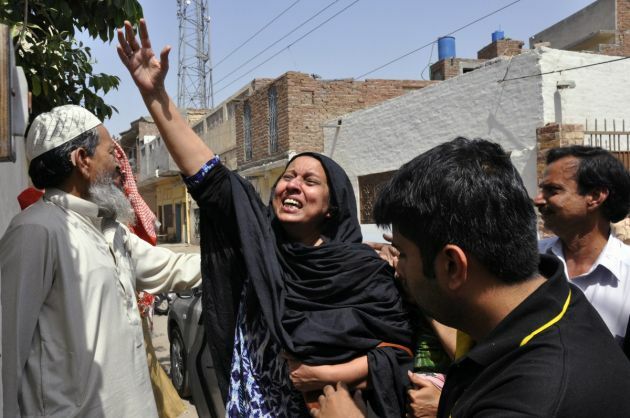 (Photo: REUTERS / Stringer ()A woman reacts to the killing of Rashid Rehman, a lawyer who was shot by unidentified gunmen a day earlier, outside his residence in Multan May 8, 2014. Gunmen posing as clients shot dead the prominent human rights lawyer defending a professor accused of blasphemy, officials said Thursday, underscoring the danger facing those trying to put an end to religious intolerance in majority-Muslim Pakistan. Wednesday's killing of Rashid Rehman in the southern city Multan was the first time a lawyer has been killed for taking on a blasphemy case, police said. A Christian pastor on death row for blasphemy was shot dead inside a Pakistan prison, while a cellmate on death row was wounded in the attack last week. Authorities arrested a jail guard who shot the prisoners inside the Adiyala prison in Rawalpindi, where the prisoners were incarcerated. The fatality was identified as pastor Zafar Bhatti, who had been jailed while his trial was underway. The other prisoner was identified as Muhammad Asghar, 70, a British national, a report from the Australian Broadcasting Corporation said. Asghar, who was convicted of blasphemy, remains in stable condition at a local hospital, a prison official told the Agence France Presse. He was sentenced to death in January after he was alleged to claim to be a "prophet"of Islam. "The employee has been arrested and investigations have been launched," the official said quoted in a report carried by ucanews. Defense lawyers argued that their client suffered from mental illness. They showed evidence that Asghar had paranoid schizophrenia, a condition that doctors in the U.K. diagnosed in 2010. Despite the medical findings, the Pakistani court which tried the Briton appeared to ignore the evidence after Asghar declared his "prophethood" in court. He even showed his business card, which contained the credential, in court. Bhatti was arrested in 2012 after he was suspected of sending "blasphemous"text messages though evidence showed he did not own the phone that was used to send the information. He was supposed to undergo trial anytime soon. The jail officer has been arrested and investigated for the motive behind the attack. The other week, a university professor in Karachi was killed by gunmen. University of Karachi professor Muhammed Shakil Auj had been called a "blasphemer" in a text messages for his liberal interpretation of Islam. Blasphemy is a contentious issue in Pakistan where its vagueness can be interpreted several ways. At least 18 persons convicted of the crime are facing death, while 20 others are serving life terms.